David Austin® English Roses. Small, upright, bushy deciduous shrub, shrub-rose (H 1-1,1 m, W 0,8-0,9 m). Branches upright to open, little thorny or thornless. Leaves broadly ovate (10-15 cm), pinnate, 5-lobed, smooth, glossy, mid green. Flowers in smaller clusters, bowl-shaped (6 cm), very double, golden yellow to bright yellow, eventually lemon-yellow; fragrant, scent of fruit and tea. Flowering period: June-October, freely flowering. Useful mostly as a solitary shrub-rose. 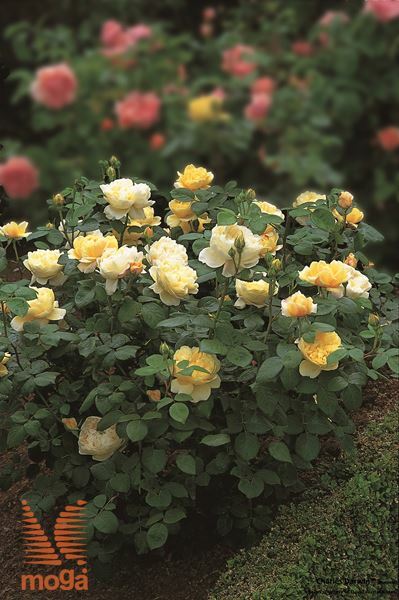 A British variety (Austin, 1991), belongs to the classical English, nostalgic varieties, grows well also in half-shade and in areas with lower summer temperatures.